A section of zinced chain held the now-shorter upper shroud taught enough to pull the now-rewelded-but-crooked mast into an almost straight line, though resulting in wildly uneven wire tensions. 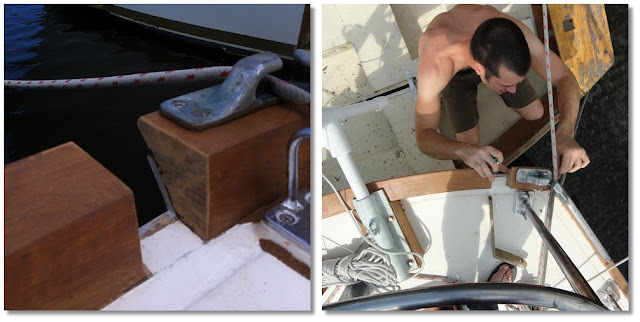 Three different fittings on three stays, leading to three leaky slots in the deck. We had plans for fixing and replacing what we could, and replacing the mast itself, but that obviously turned into a full re-rig from the chainplates up. I wanted to go with external strap chainplates for simplicity, inspectasbility, and to stopp the leaking. Bonus: the old chainplate fins get cut out of the lockers. It started when I got a good deal on some oversized 3/8" x 2" aluminum-bronze plate over a year ago. It has similar tensile strength to stainless, but for good faith in the bronze, I upsized from the 1 1/2" x 1/4", the rig's minimum stainless steel chainplate dimensions. The bronze ended up not bending well and needed to be cut and welded to the necessary angles at the deck. This made me and my engineering consultant-friend a bit nervous, but when he saw the size and quality of the finished product he agreed that it would be sufficient. The space shuttle and the moon lander were welded after all. We've shown you some progress in the past few months of cutting out the old fins, and more recently glassing over the area with multiple layers of biax/mat cloth and epoxy. The new chainplates are arranged differently due to the rig. The new mast is a double spreader rig with only one set of lower stays instead of our old single spreader rig with dual lower stays. We have chosen to opt for the new mast's single lower shroud assembly, so the the old front and rear chainplate areas have only been smoothed into the wall, while the center plate location has been beefed up with three additional layers of biax/mat fiberglass to function as a backing plate (yes, fiberglass is an excellent backing plate when sufficiently thick) for both the upper and lower stays, side by side. 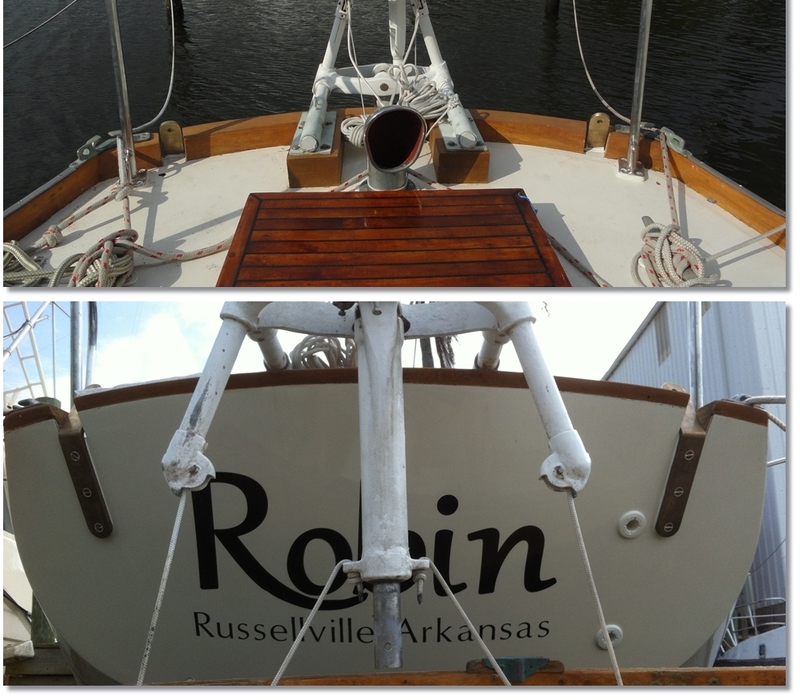 We started with the port side since it was against the dock. When we finally got to drill through and measure the hull thickness last week, it ended up at 1 1/16" thick. 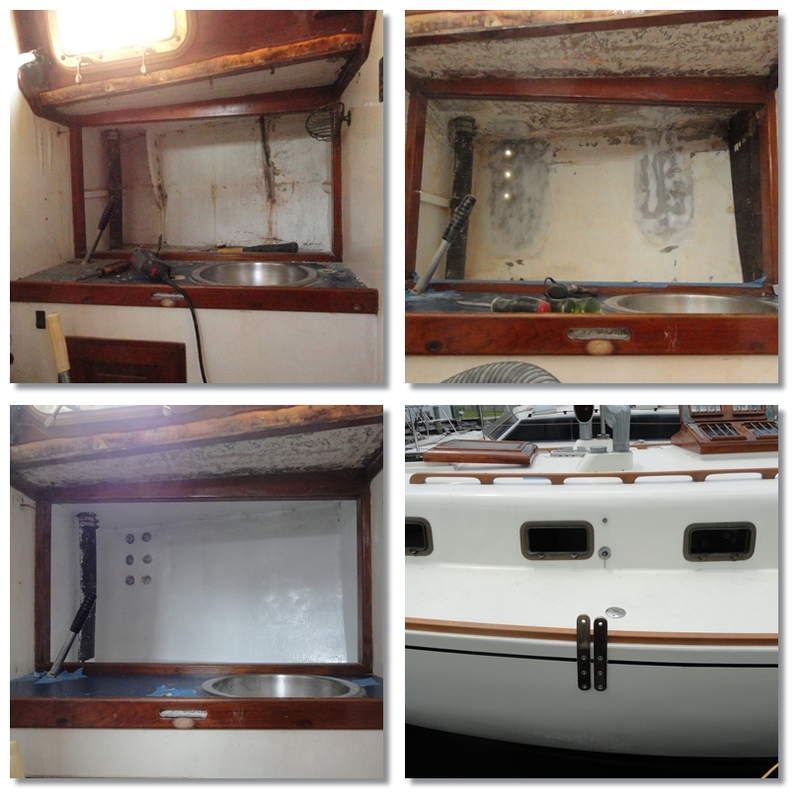 Minus our added glass, that means the solid glass hull thickness at the deck joint is about 3/4 to 7/8"! We probably didn't even need the added glass, but it is nice to know it is there. Then we finally got to finish the cabinet and bolt our plates through. Final touches will be cedar shelves and wrapping that ugly hose in some white duct tape. A finished cabinet on the boat! Pay no attention to the underdeck immediately in front of the cabinet, we have decided to just sand it out and cover our underdecks and cabin roof in insulation and vinyl headliner. This really gets me excited. Last time we were living aboard, we noticed the heat radiating from our cabin roof and decks at the end of every day, and Lee Macgregor our salty sailor from Tales of a Salty Sailor, commented on how hot our cabin was, almost insisting that we put up insulation. Here-say tales from other sailors in the area claim about 5 degrees cooler cabins on sunny days after insulating. I see this as a refining touch for life aboard, plus it means less sanding and painting. 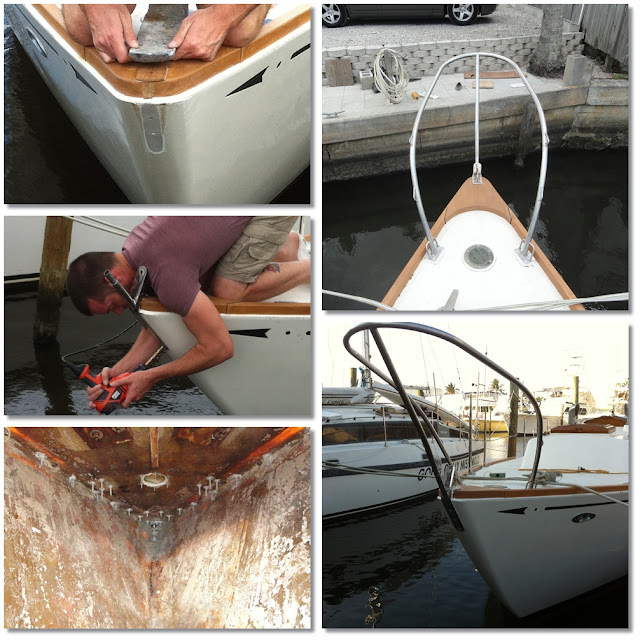 We re-launched Sparrow, our already-aging homebuilt dinghy, to assist with the installation of the starboard side and transom chainplates. The straightness of drilled holes and the amount of things-not-dropped-overboard greatly improve when you have your work surface right in front and facing you instead of below and backwards. The aft chainplates were a bit more complex than the sides. First, the angle of the transom meant that the bend in the plates absolutely had to be flush on the deck for good structural sense. This is true of any chainplate, but there is quite a bit of forgiveness when a plate is only bent to 5 degrees, these ended up at 60 degrees, so anything below the plate's bend will be in bending force if it isn't properly supported with a good fulcrum at the bend. The transom is about 7/16" thick and comes up past the deck in a flange, then the rear section of toe rail is notched to accept that flange. I had to cut both the toerail and the flange in order to get the bend where it needed to be. You can see the transom flange and toerail cross-section in the first picture below where I cut the big sections out for the chainplate. It is an odd arrangement that results in the toerail appearing 3" high from the side, and about 1 1/2" tall from the back. It also increases the apparent size of the transom. The chainplates ended up looking a little lower on the transom than I would have liked, but structural integrity beat aesthetic every time. The second issue with the heavily sloping transom was the top bolt hole of the chainplate was so close to the bend that it basically went right into the deck. There was no way to get a nut on the back. 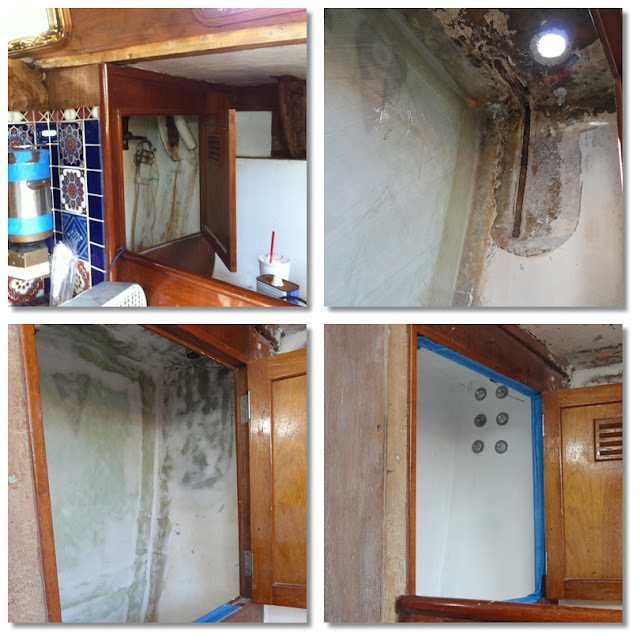 Well, I had just recently learned that fiberglass taps and holds bolts nearly as well as steel, so I solved this problem by underdrilling the top hole and tapping the fiberglass transom. We also added the requisite three layers of biax/mat inside the lazarette for backing pads on the lower two bolts. And it didn't end up looking too bad. We plan to add wooden bridge covers over the top of the big notches we had to cut. That way the wood line across the back won't be broken. It will end up kind of looking like an intentional drain slot that also functions as chainplate clearance... not too aesthetically pleasing, but at least it will look intentional. The curve of the transom and the crown of the deck make the plate tangs slant slightly inward on the transom. It makes a nice frame for the name. The old teak bow plank (bow block? big wooden termination block for the toerails?) was 3 inches tall and angled outward. The new bow plank is vertical like the new toerails and only 1 1/2 inches tall. The old stem fitting is no longer even close to the new shape of the nose of the boat, nevermind it was also cracked and failing. So we had a new one locally made in stainless steel. Since we didn't want to redrill new holes in the nose of the boat, we had the plate made up to fit. Between the errors of a cardboard template matching a boat's nose and a hydraulic bending machine making stainless plate match a cardboard template, the stem fitting ended up needing a slight shim to fit just right. I whipped one up out of some spare teak and glued it in place using a big ignot of lead that I also happen to have sitting around. Also, the nose of the boat was looking relatively thin at "only" 5/8" thick, so we beefed it up with five layers of biax cloth. Getting into that anchor locker is no fun. You have to be really careful not to cut your head open on all those ceiling screws, which incidentally represent the number of times somebody has had to crawl in there with a wrench, usually me. With the stem fitting bolted on we could reattach the original pulpit. The absence of the pulpit was the only the only thing keeping us from putting on lifelines. Looking great! Just read through your entire blog and really enjoyed it! I am adding it to my links page on my site and will check back often. Keep up the good work!